Allow child themes to enable accessibility features for web users with disabilities. Improvements to the Schema.org microdata Genesis outputs. Compatibility with WordPress’s generated Title Tag output. Compatibility with WordPress’s new Site Icon feature. Allow entry meta to be turned off on a per post type level. NOTE: If you have made any changes directly to files in the /genesis/ folder, upgrading will overwrite these changes. Therefore, we recommend that you NEVER make changes this way. Alternatively, use the CSS in the child theme folder to make stylistic modifications, and use the proper PHP files in the child theme folder, along with the Genesis Hook system, to make functional/output modifications. Click the “upgrade now” link in the update notification at the top your your dashboard page. After the new version is installed, click the link to complete the upgrade. Before you upgrade anything, make sure you have backup copies of your child theme. Log into the dashboard to complete the upgrade process. WordPress 4.3 is now available, with new features that make it even easier to format your content and customize your site. All current Watershed Studio WordPress Upgrade Service and Maintenance Package subscribers have been scheduled for your WordPress 4.2 upgrade. WordPress 4.2 is now available, with new features that help you focus on sharing content, and global communication. WordPress 4.1 is now available, with new features that help you focus on your writing via a new “distraction-free writing mode”, and the new default theme, Twenty Fifteen, which lets you show your site off in style. All current Watershed Studio WordPress Upgrade Service and Maintenance Package subscribers have been scheduled for your WordPress 4.1 upgrade. WordPress 4.0.1 is now available, and is a critical security release for all previous versions of WordPress. Sites that support automatic background updates will be updated to WordPress 4.0.1 soon, if not already. BUT, we have been seeings issue with the automatic upgrades this round, so please check your sites. If you spot any issues, please contact us for assistance. If you are still running WordPress 3.9.2, 3.8.4, or 3.7.4, you will be updated to 3.9.3, 3.8.5, or 3.7.5 to keep everything secure. If you are running older legacy versions of WordPress, please upgrade to 4.0.1 immediately. Three cross-site scripting issues that a contributor or author could use to compromise a site. An issue that could lead to a denial of service when passwords are checked. Additional protections for server-side request forgery attacks when WordPress makes HTTP requests. An extremely unlikely hash collision could allow a user’s account to be compromised, that also required that they haven’t logged in since 2008. WordPress now invalidates the links in a password reset email if the user remembers their password, logs in, and changes their email address. Version 4.0.1 also fixes 23 bugs with 4.0, and also two hardening changes, including better validation of EXIF data we are extracting from uploaded photos. Anyone who is already subscribed to one of our upgrade packages has already been upgraded to WordPress 4.0.1. If you’d like to ensure that your site is always up to date, please check out our WordPress Maintenance Packages. 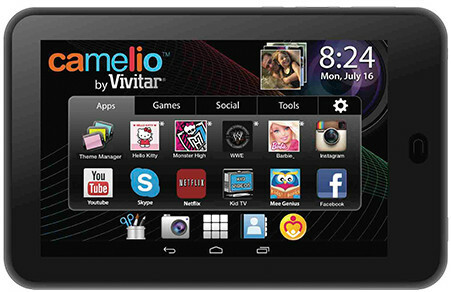 The CAMELIO ($99.99 from Amazon.com) is a unique, Android tablet that allows you to customize and personalize your tablet with your favorite characters. Up to 5 users can easily create their own profile and customize their account with Camelio “Personality Packs” (sold separately). Personality packs allow users to customize wallpaper, widgets, lock screens, camera and photo editor and a themed bumper case. In addition, licensed games, video, music, and books are also included and vary by theme. As an adult I certainly wouldn’t trade in my Samsung Galaxy Tab 10.1 for it, but this is a great, inexpensive, tablet option for children. My own kids have been using this for a while now, with no complaints other than who gets to use it next. Bottom Line: Buy it for the kids, they’ll have a blast with it, and it will free up your own phone and/or tablet. Plus being Android based, there are plenty of free game options they can choose from, such as Angry Birds and Temple Run. WordPress 3.9.2 is now available as a security release for all previous versions. We strongly encourage you to update your sites immediately. This release fixes a possible denial of service issue in PHP’s XML processing, reported by Nir Goldshlager of the Salesforce.com Product Security Team. It was fixed by Michael Adams and Andrew Nacin of the WordPress security team and David Rothstein of the Drupal security team. This is the first time the two projects have coordinated joint security releases. Prevents information disclosure via XML entity attacks in the external GetID3 library, reported by Ivan Novikov of ONSec. Download WordPress 3.9.2 or venture over to Dashboard → Updates and simply click “Update Now”. Anyone who is already subscribed to one of our upgrade packages has already been upgraded to WordPress 3.9.2. If you’d like to make sure your site is always up to date, please check out out WordPress Maintenance Packages. We have a new OIOpublisher coupon code for August 2014. Now through August 31st, 2014 you can purchase OIOpublisher* for just $37 (normally $47) by using coupon code “HOT14-WSHED” (no quotes).